Basu Sashi Biogrpahy. Basu Sashi father's name is Bhumimananda and his mother's name is Hitkumari. His nawaran name was Vasudev Vaidya. Basu Shashi used to know the letters at home at an early age. After reading a little while with the bomb, he started reading at Padmodaya High School. After reading there at the age of nine, he wrote the poem titled 'Student'. The poem was printed in a magazine called 'Student'. At the age of 14, he passed S.L.C. In 16 years he came to IA. Passed Then he started his B.Ed. In 2014, he received gold medal by reading the poem titled 'Basanta Kokil' in the Competition organized from Nandratri High School. In the year 2013, he published literary quarterly magazine called 'Nava Nirman'. In 2014, he edited the 'Goreto' and 'Lokdut' magazine. B.A. In the first year, on the basis of literary talent, he got an opportunity to visit India. His mother played a sitar. She learned from mother to play tabala. He had received inspiration from poem poet Siddhi Charan Shrestha to write poems. In 2004 B.S. he served as social activist as the work of the local charityorganization. In the year 2008, he established Jayabageshwori library. He started literary program in library. His program was performed by Mahakavi Laxmi Prasad Devkota, Dramatist Balakrish Sam, poet Kedarnath Bethit, historian Balchandra Sharma etc. In 2009 he organized the Birat literature conference in the chair of Laxmi Prasad Devkota. He started to served as a headmaster since 2009 at Sharda Middle School, founded in 2008. In the Newari language, he began to play drama-writing and manchan. From 2015 to 2016, he taught at Pharping Boarding High School. At that time he wrote the drama in Nepali language. He wrote four drama in Newari language. In 2016 B.S., he Established the 'Rodhighar' literary institution together with the Bhupi Sherchan, Krishnavabhit Shrestha. By organizing literary programs from that organization, he created a new environment for writers. From that same year, he started his employment at Nepal Rajakiya Pragya Pratisthan. His mother died in 2017 years. Since 2019 B.S. for three years He has been in Banaras of India to publish Nepali language dictonary. In the year 2038, he established the 'Sanchaya Press'. In 2039 years, he was awarded for the novel 'Phool Ooilayepachi'. 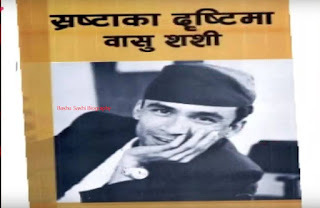 His published works are 'Meri Usha', 'Vasu Shishi ka Kabita', 'auta khola ma aafaibhitra; , I have myself in', 'bashurima naatayaka dhun haru', 'Bishow ka shrestha katha' etc.